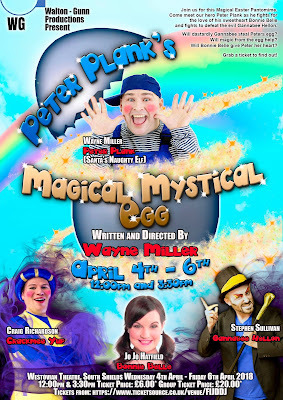 The Westovian's Theatre on the South Shields sea front is host this week to a pantomime written by local actor Wayne Miller, who also stars in the titular role. Rather than reboot a Christmas favourite we have something which is Easter themed and perfectly suited to a smaller scale production. The end product was worth a drive in the heavy rain to go and see. The interior of the Westovian’s Theatre has that “end-of-the-pier” feel and April should be the start of the summer season, if the council parking charges are to be believed. But the rain lashed down in the coastal resort. Inside the venue where a very young and excited audience, some of whom might have been getting their first taste of theatre or of a live show. Certainly it was a much younger crowd than either of the last two pantos we had seen Stephen Sullivan in 3 months ago. Stephen started the midday proceedings as the bad guy Gannabee Hellon. This was going to be a tricky start, narrating the start and showing how evil he was, to a crowd barely weened off Peppa Pig and In The Night Garden. With some parental help, the kids started booing him and they soon got the idea. The basis of the story is that Peter Plank (Wayne Miller) had found an egg in the forest. Upon trying to see what was inside the egg, the egg’s magical keeper CrackMee Yup (Craig Richardson) informs him that the owner of the egg can have a wish. He decides to have a think about it as he wants to decorate the room before the girl that he fancies Bonne Belle (Capital Radio presenter Jo Jo Hatfield) arrives. This is the key for a decorating themed messy scene which takes advantage of Wayne Miller’s ability to fall spectacularly and regularly, and the still get up and carry on. These capers had the youngsters around me squealing with delight. Certainly, the physical humour was hitting the spot with the little ones better than the verbal jokes it seemed. Every panto needs a bad guy and Sullivan relishes the opportunity to wind the audience up. We loved him in his Newcastle debut as a baddie and he has lost none of his devilish charm in this production. His character wants to acquire the egg in order to gain power but he has to befriend and persuade Peter Plank to give it up. The success of his role was captivated in the moment he appeared for the take off scene in the second act. As soon as he appeared the kids erupted without any prompting. This was a real highlight of the audience participation. Like any good panto, the kids get plenty of chances to hurl their responses at the cast throughout the show. Wayne Miller pitches Peter Plank perfectly as the slightly dippy and yet approachable friend of the young audience. He also can sing – indeed, he managed to get a big plug for his Friday night slot at Ziggys in there too – we did notice! The bulk of the solo songs are very capably handled by Jo Jo Hatfield, who has had previous successful roles in musicals. The singing did flag up some sound issues from time to time but hopefully these bugs will be fixed as the run goes on. It was the first show of the run after all. The songs were often accompanied by two dancers, Lori Smedley and Loren Robson, who remained focussed on their routines even when chaos was happening elsewhere on stage. 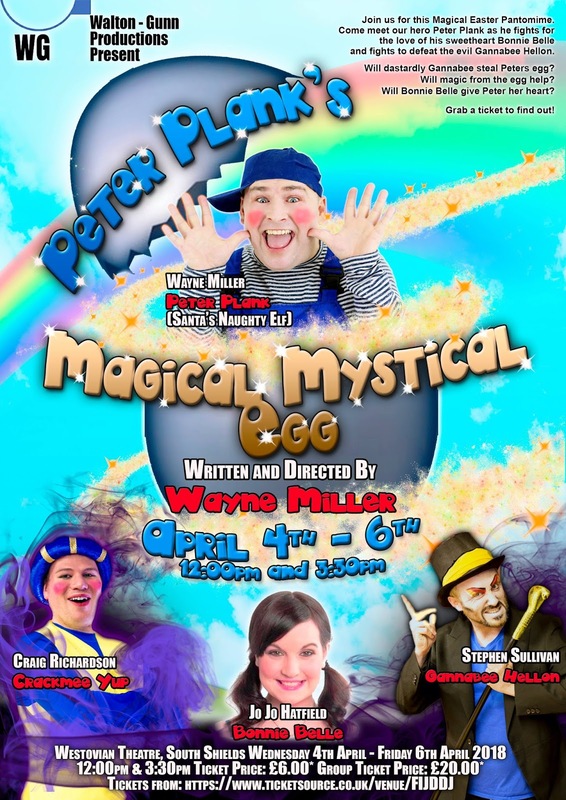 This is a panto without a Dame, as Craig Richardson acts as Peter Plank’s magical minder (a la The Genie in Aladdin), so the humour stays more kid friendly than with most pantos. Craig and Wayne related well as a double act and have obviously spent some time working out the physical routines that worked so well. Jo Jo Hatfield also related well with the kids and Wayne’s character, maintaining the show’s positive vibe. The result was a show that felt much more like summer special rather than the reality of the heavy precipitation outside. A quibble? I would have shaved a bit off the first half as the very young members of the audience were getting wriggly, as they do, at the 45 minute mark. On the whole, it is an entertaining couple of hours to keep the kids amused during the Easter Holidays for less than a trip to the multiplex cinema. In other words, it hit the right spot for its target audience.